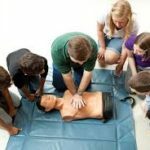 HeartSaver Firs AID and CPR & AED courses are designed for non-medical professionals who needs a course completion card for job regulatory, or other requirements. These courses can also be taken by anyone who wants to be prepared for an emergency in- and – out of hospital setting. 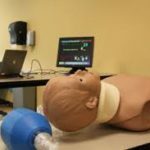 The goal of HeartSaver courses is increase survival rates, improve recognition of acute illness, and preventing further illness or injury, and promoting recovery. New course materials based on the 2015 American Heart Association Guidelines Updates for CPR and ECC will be released throughout 2015-2019. * First AID Educational Design skills practice and learning. The HeartSaver classroom courses are video based where are students practice-while-watching technique that allow students to practice skills as the video guides them. AHA instructor emphasizes on interaction participants and hands-on coaching, and feedback during skills practice enhances learning.